Summers in Baltimore, Maryland are known for a few things, heat, humidity, and beautiful wood decks, You see, despite the muggy summer weather, you can’t keep Marylanders from enjoying the finer things in life, like a pile of fresh steamed crabs heaped onto some old copies of the Baltimore Sun. Yummy! And where do these brave Baltimoreans prefer to feast on these delicious crustaceans? If you guessed their decks, then – Ding! Ding! Ding! – you are correct. Nothing beats lazy summer afternoons on your own, personal wood deck. If you don’t have a deck, just imagine how much better life would be with a beer (glass of wine, or soda) in your hand and a new wood deck under your feet. When it comes to selecting the right deck for you, your home, and your budget, the decision between wood and low maintenance decking can be a difficult one. Each type of decking has its own unique benefits. There is no PERFECT deck. It all comes down to personal preference. This week, we are going to take a closer look at the benefits of wood decks to help you make a well-informed decision. If you want a traditional look, nothing compares to wood decking. There is just something about the look of a freshly stained wood deck that will send shivers down your spine. With an average return on investment (ROI) of 87%, according to Remodeling Magazine’s annual Cost vs. Value Report, wood decking will help increase your property value more than most other home improvement projects. We know what you are thinking; it’s wood. Termites and rot have to be a major issue, right? Well, not quite. All wood decks are framed with pressure treated lumber which helps prevent decay and termite damage. Wood decks are extremely strong and durable. Wood requires very little maintenance over its lifetime: hammer in a few loose nails, apply stain, enjoy! Believe it or not, wood decks are also extremely afforadable! Wood decks are the most cost-effective way to add value to your home. Finally, a new deck helps increase the living space of your home, giving you an outdoor venue to entertain or just relax. Aaaaah! You can practically feel the stress melting away already. With 40 years of experience, Freedom Fence & Home has provided the highest quality deck construction services throughout Baltimore and Harford counties. Our crews are experienced, knowledgeable, and high skilled, ensuring each deck we build is properly installed to meet your expectations. Best of all, every wood deck we build comes with a 5-year limited warranty on workmanship and material. 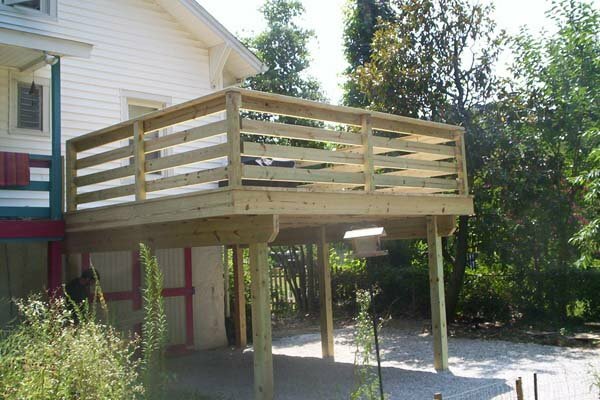 If you have any questions about Wood Decks in Baltimore, please contact Freedom Fence and Home by calling 443-271-6841 or visit our website. You can also follow us on Facebook and Twitter! This entry was posted on Tuesday, July 1st, 2014	at 3:14 pm	. Both comments and pings are currently closed.